With lots of new features and improvements, translatable strings have changed significantly, too. Even for languages that are in great shape in 2.0, things don’t look that great in 2.2 – yet. When we started following the string freeze principle for Zabbix 2.0.3 release, the goal was to give translators some time period before each release, thus increasing the chances of a translation being completely finished. That did help, and 2.0.3 came out with 6 translations at 100%. Now the translation freeze for Zabbix 2.0.5 starts. As announced two months ago, translation/string freeze is obeyed now. Zabbix 2.0 branch enters freeze now in preparation for 2.0.4 release. For 2.0.3 our awesome translators managed to get 6 translations to 100%. How will it go for 2.0.4? Zabbix is translated in multiple languages, 21 in total. 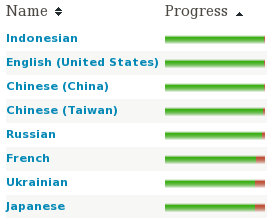 Some are in better shape, some in worse, but the 2.0.3 release marks something fairly unique – 6 languages have 100% coverage. The translation improvement initiative is progressing nicely. We had a large jump for French from 69% to 100% and Japanese did the last sprint from 98% to 100% as well. The last percent for Chinese (Taiwan) was finished even before that, thus there are currently 5 translations that are 100% finished. Hooray! Another significant improvement was German, going from 81% to 94%, and Ukrainian went from 79% to 87%. Still some 8 hours left to get the translations in 2.0.3. While large surprises are less likely to happen now, let’s see whether there will be any other noticeable improvements. 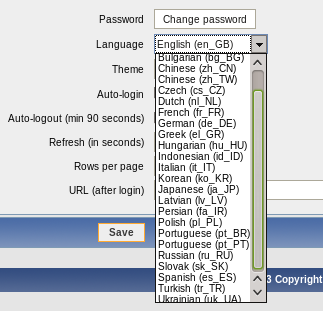 As many already know, Zabbix is translated in many languages, better in some, worse in others. With all the improvements that have happened to the translation framework and processes, including moving to gettext and recent introduction of string freeze, it seems like a good time to set some goals. How about getting as many translations as possible to 100% for 2.0.3? Zabbix is already translated in quite a lot of languages, but there could always be more, and the available ones could have better coverage. There are several ways how translators’ work can be made easier, and one step is the introduction of string freeze, starting with Zabbix 2.0.3.